"This is a pie with the flavor of a German Chocolate Cake." In a medium saucepan, combine the 1/3 cup sugar and the cornstarch. Stir in the milk, chocolate, and 1 tablespoon butter or margarine. Cook and stir till thickened and bubbly. Reduce heat; cook and stir 2 minutes more. Gradually stir about 1 cup of mixture into egg yolks. Return mixture to saucepan; bring to boiling. Cook and stir 2 minutes more. Stir in vanilla. Turn the hot pie filling into the baked pie shell. In another saucepan, combine the beaten egg, evaporated milk, the 1/2 cup sugar, and 1/4 cup butter or margarine. Cook and stir over medium heat just till the mixture is thickened and bubbly. Stir in the coconut and pecans. Spread the pecan mixture evenly over the chocolate filling. Cool the pie on a wire rack; chill thoroughly. This is the closest I have found to the German Choc. Pie at Tippins!!! This is as good as it gets! 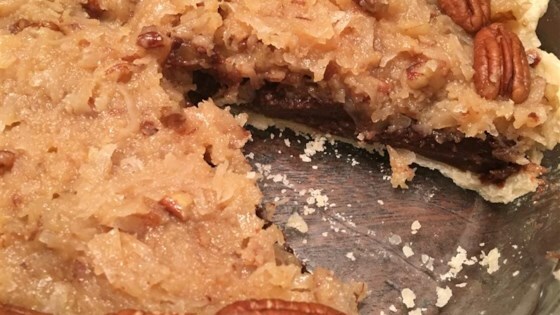 My wifes favorite German Chocolate Cake has now been replaced! Too easy and excellent every time.